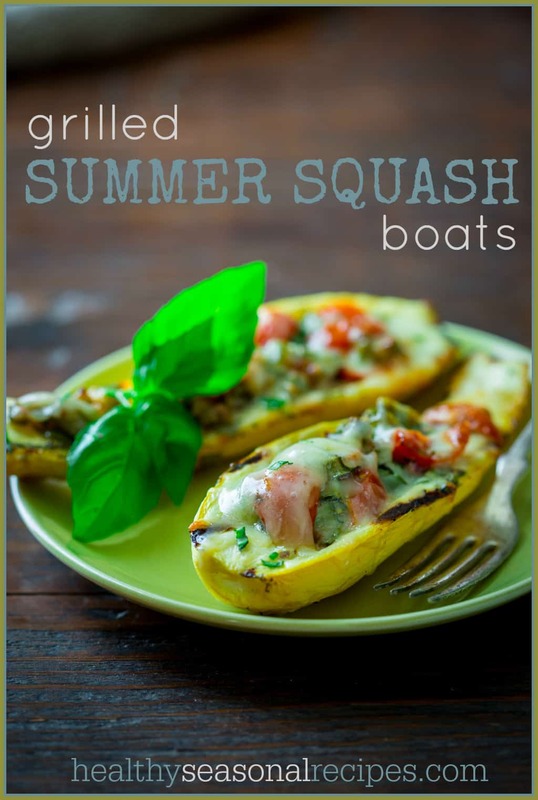 Low-Carb Grilled Summer Squash Boats are an awesome gluten-free vegetarian grilling recipe! Just in time to help you use up some of those yellow summer squash that are bursting out of the garden right now. Plus check out my veggie grilling tips below! I originally shared this recipe on July 11, 2014. I have updated the images and some of the text today. I stopped at the farm stand the other day and I was blown away by all of the gorgeous local yellow summer squash. To be honest, I stopped there to buy some beets because I was thinking of making some pickled beets, but then I saw these squash and I was completely at their mercy. I am totally the kind of cook who prefers to shop for produce by what catches my eye, than one with a specific ingredient in mind. I love summer squash and zucchini. And like most veggies in the cucurbit family, its easy to end up with more than you know what to do with. So this delicious low-carb vegetarian recipe is here to save the day. During the summer I really like to keep my recipes simple. I want to let the summer bounty of veggies shine in all of their delicious glory. And I don’t want to spend all day in the kitchen. Well, this recipe does just that! 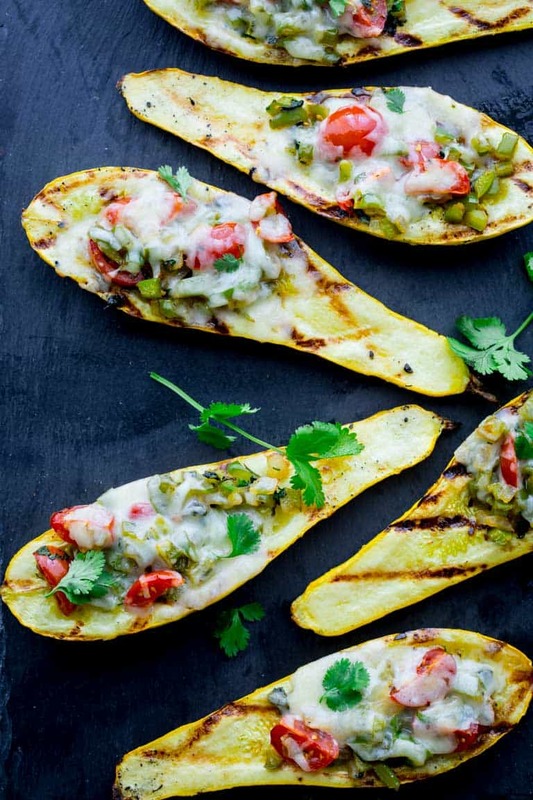 All you have to do is cut the squash in half and stuff them with sautéed peppers, fresh herbs, top with melted cheese and throw them on the grill. Bing bam boom! You’re done is just 40 minutes and ready to dig into an unbelievable yummy low-carb and vegetarian meal. Perfect for these hot summer nights! Keep your veggies from sticking by either lightly tossing them with oil or brush oil directly onto the grates by dipping a paper towel in oil and using tongs. Cut your veggies small enough so they will cook quickly, but not so small they will fall through the grates. Put smaller veggies on skewers or use one of those snazzy grill pans. Use high direct heat to sear your veggies and then lower indirect heat if needed to continue to cook them without burning. Do this by turning one burner on high and leave the other burner(s) off or on low. Grill your veggies in foil packets. This is especially awesome for vegetables that take a little longer to cook like potatoes and carrots. Are you the kind of cook who has a particular ingredient in mind, or do you shop by what looks good? Are you growing summer squash in your garden? 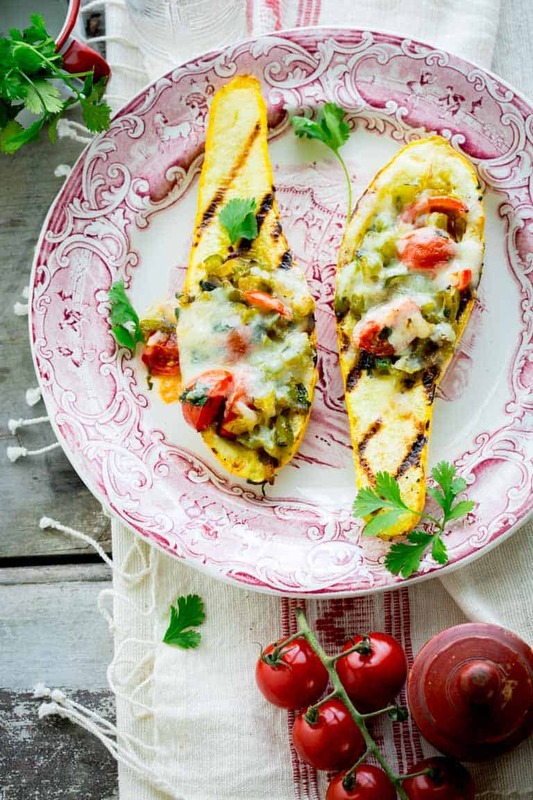 What are your favorite ways of using summer squash? 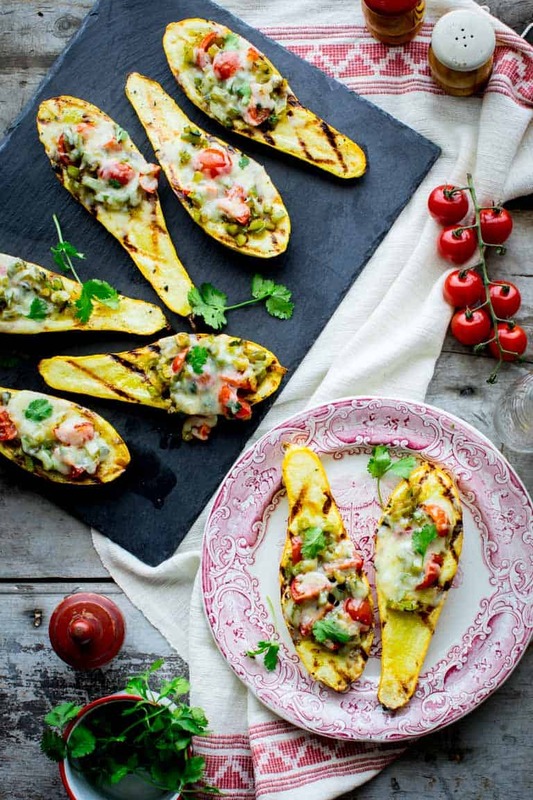 Low-Carb Grilled Summer Squash Boats are an awesome gluten-free vegetarian grilling recipe! It will help you use up some of those yellow summer squash that are bursting out of the garden right now. Preheat grill for indirect heat on one side. For gas grill with two burners, use only one burner on high. For three burner grill use two on medium- high. For charcoal grill, when coals are ready rake them to one side. While grill heats, heat two teaspoons oil in a medium skillet over medium-high heat. Add pepper, onion, ¼ teaspoon salt and pepper and cook, stirring often until the vegetables are softened and starting to brown, about 5 minutes. Remove the skillet from the heat and stir in tomatoes and basil or cilantro. While the vegetables are cooking, prepare the squash. Cut squash in half lengthwise. Hollow them out slightly using a Parisian scoop, a teaspoon or apple corer. Brush the remaining 2 teaspoons oil over the squash. Sprinkle the remaining ½ teaspoon salt over the squash. The grill should be about 350 degrees F. inside with the lid closed. Grill squash cut-side-down on the hot side of the grill until starting to soften and they have grill marks, 5 to 8 minutes. Flip them over onto the other side of the grill without heat under them, so they are cut-side up. Divide the filling among them. Top with the cheddar, dividing evenly. Cover the grill and let cook until the squash is completely tender and the cheese is melted, about 15 to 18 minutes. Season with more salt if desired. These looks delicious. And so summery and fresh! I might just have to make these for lunch! Thanks so much Jo! Hope you enjoy them. We’re getting great summer squash in Atlanta and I’m about to post a summer squash and vidalia onion bread pudding. I LOVE this recipe, Katie. Stunning photos as well! Ooh that sounds Delish. Have we discussed how much I love savory bread pudding? I’ll have to come by to see your post. Thanks for the compliment about the photos. I Love this recipe! 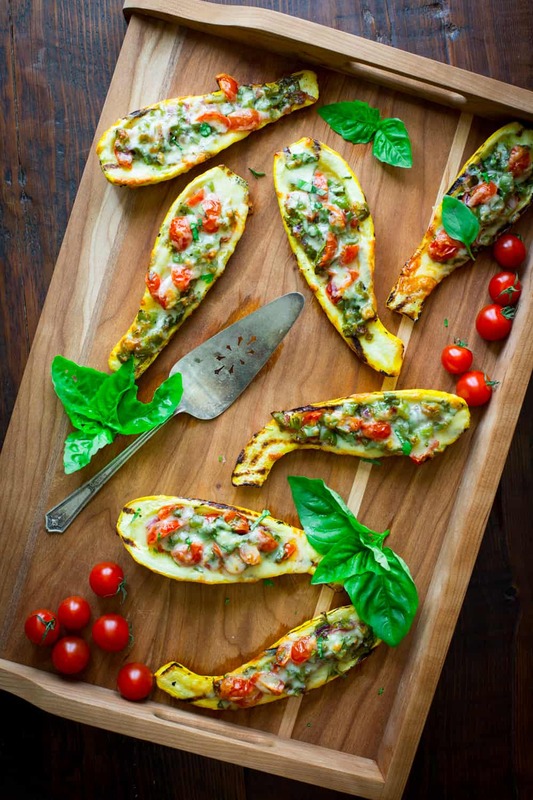 I’m a huge fan of Summer squash and this is right up my alley. Thanks Norma. Glad to hear it tickles your fancy. 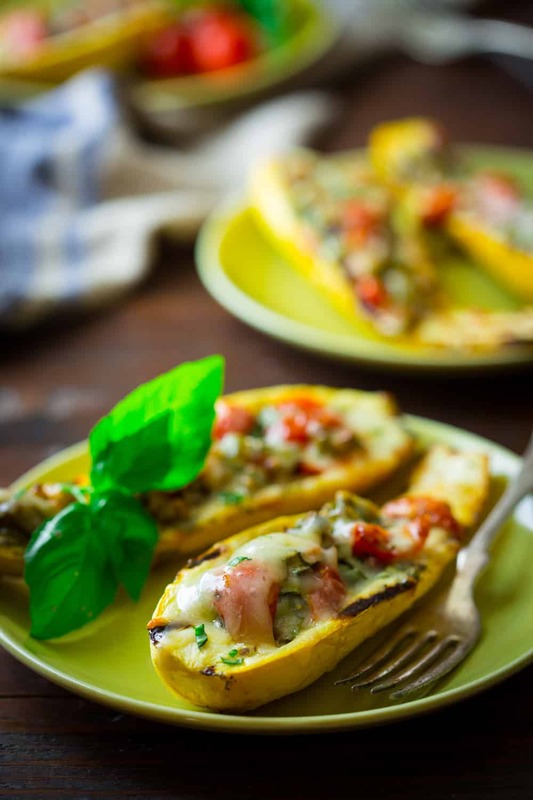 Love that you used the yellow summer squash for the “boats”, looks delicious! Thank you. We really enjoyed the combo, now I can’t wait to try other fillings too as the squash keeps coming in. This is so creative and smart Katie!! 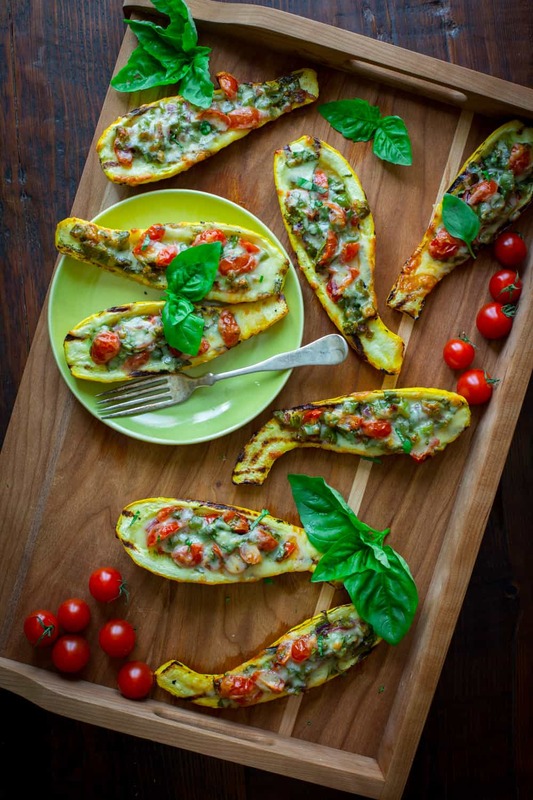 Love how you are using the abundance of summer squash! These are adorable and look mighty tasty!!! I just so happen to have a fridge full of squash and a huge hankering for something cheesy! Looks delicious!! Our neighbor just brought us more zucchini and summer squash yesterday, so it looks like there will be more of these in our future.Glad to hear these appeal to you too Maria. Thank you for visiting. I’m with you on the instinct purchases Katie, I can’t tell you how many times I’ve gone into the supermarket thinking I was going to make one dish, then a certain vegetable or fruit just looks SO fresh that I can’t pass it up, and I turn out making something totally different 🙂 these boats look super delish and perfect for summer – loves! Ha ha, yes, Totally! Especially with things like peaches or berries. I can’t resist! This is exactly what I was looking for. Thanks for sharing this great post. That is very interesting and I am always searching for informative information like this! I love summer squash! These look so delicious, healthy and perfect for hosting! I am so with you. I am always torn between growing summer squash and zucchini in my garden. They are both so good! But it would be hard to keep up with two plants! That looks wonderful, so simple but packed full of great summer flavours. Thanks so much Brian! Glad you like this recipe. 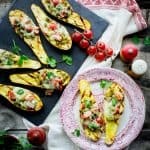 These look really delicious, and I love the summer squash too! Using slices of squash as a base, in place of pita or a pizza base, really appeals. It is a natural way to eat light in the summer! We are all about the summer squash recipes at the moment and stuffing them is a great idea. It looks delicious! That’s great to hear Danielle. Eating tons of veggies in the summer is so easy! Thanks for coming by. Have a great week. That’s what happens most of the time for me too when I have a list. Fresh fruit and veggies just end up in my cart!